J S Fry and and sons works fire engine picture with Chief Fire Officer Des Ryan early 1970s. 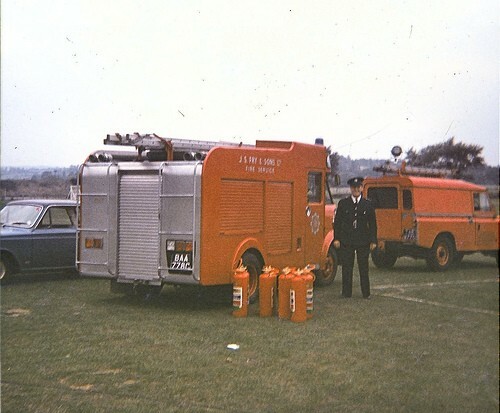 The picture was taken opposite the canteen on the field where the local Fire Brigade tournaments were held to compete for the MiniMax Shield which Frys one on this year. Des Ryan served and ran the Fire Brigade from 1960 to 1982 until he retired. Thank fully BAA 778C has been restored and looked after by Aidan Fisher. The Land Rover is the crash rescue vehicle from Filton airfield. Added by Bristol Bob on 10 October 2018. Hi Bristol Bob, I have seen a lot of your photos and they are great. This is indeed Des Ryan my Father, on the Canteen field and J S Fry and Sons (later Cadburys). I have found memories of the Fire Engine whilst growing up, and spent many an hour being driven around by the Brigade on training nights. Thankfully it is being well looked after by Aidan.If you have anymore photos of Frys please get in touch. Added by Rich on 29 November 2018. Hi Rich, I don't have any more pictures. There is a book, "The Somerdale Story" which has a small piece about the Brigade, which may be of interest to you. Added by Bristol Bob on 05 December 2018. Hi Bob Thanks for that, I have the book. I met with Eric Miles last year, he used to work with my father in law in the Engineering department at Frys. Thanks for the info on the Land Rover in the picture, I don't suppose you have any further info on the Land Rover ? Added by Rich on 05 December 2018. Hi Rich, the Land Rover was originally the rescue vehicle at Filton.Call sign was FOX. After being replaced by a Bedford it was used as a general run about vehicle, call sign was ABLE. The reg was TAE 877G I believe. Added by Bristol Bob on 06 December 2018.